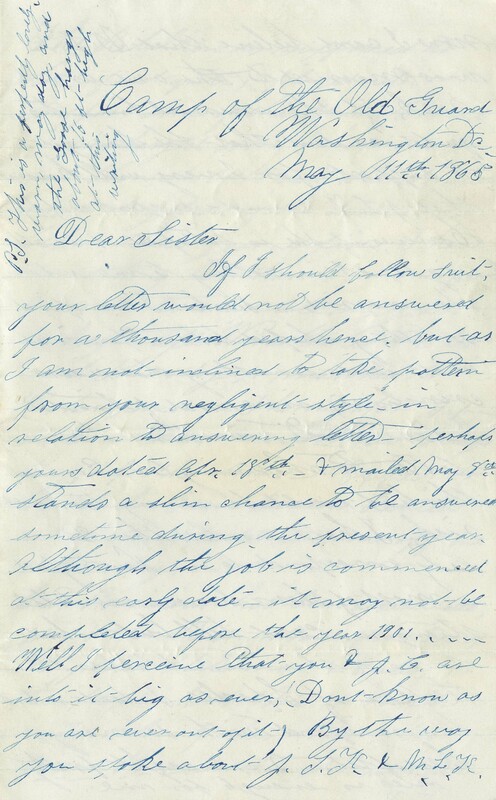 Letter written by William H. White from Camp of the Old Grand, Washington, D.C, to his sister in Milwaukee, Wisconsin, describing the reaction of the soldiers to the assassination of President Lincoln. If I should follow suit, your letter would not be answered for a thousand years hence but as I am not inclined to take pattern from your negligent style in relation to answering letters, perhaps yours dated Apr. 18th & mailed May 8th stands a slim chance to be answered sometime during the present year. Although the job is commenced at this early date, it may not be completed before the year 1901. . . Well I perceive that you & J.G. are into it big as ever, (Dont [sic] know as you are ever out of it) By the way you spoke about J. T. K. & M. L. K.
now I cant [sic] believe that M. L. K. was married to the one armed Jack, if she married him, ‘tis quite evident that she has got him to support for I very well know that J. T. K. cannot support a fly. However, if she is satisfied, it is all right, it is nothing to me who she marries. Reckon I can find something shaped like a feminine [sic] (or at least something that wears crinolines) in course of time! I dare not venture a letter to charming M. C.— think it would be running too much risk, I have no less than 20 lady correspondents in New England –most of them however are total strangers, cant [sic] tell but what some of them are blacker than the Ace of Hades. I dont [sic] intend to correspond with so many hereafter, 2 or 3 right pretty ones is enough for me. The Rebellion is supposed to be (if not quite) played out. Suppose some of the volunteers will be discharged soon, I havet [sic] think that Hancocks rect’s [recruits] will stand much show to get out of the service before their year expires. I have something less than 8 months yet to serve to complete my year. My Reg D left Winchester VA last week Thursday, & marched to Washington via Thoroughfare Gap---(distance 100 miles— took us 5 days to make the trip.—Expect to be to the Grand Reaiew Review which is expected to come off one of these days. . .
a Father & Brother to us all, & the Nation mournings is sincere, & heartfelt, Booth has been is caught, & has paid with his life, for the foul deed. The South have lost their best friend. They will be likely to find in Johnson a hard master to deal with . . . . Our Country is safe. Freedom shall live in America. I must now begin to taper off a little else get another sheet—the latter will not pay for I havent much of anything more to pawn this time. You must try & answer this right off. Remember now, right off. Let me know about family affairs, etc. etc. P.S. Regards to all inquiring friends. This item is in the public domain. As a service to other researchers, we request that users credit the University of Wisconsin-Milwaukee Libraries as the source. All Objects and images copyright their respective instutitions. American Express is proud to sponsor Remembering Lincoln. This project was made possible in part by the Institute of Museum and Library Services, grant number MA-10-13-0274-13.